2009 Sportsman Championship at Riverside. 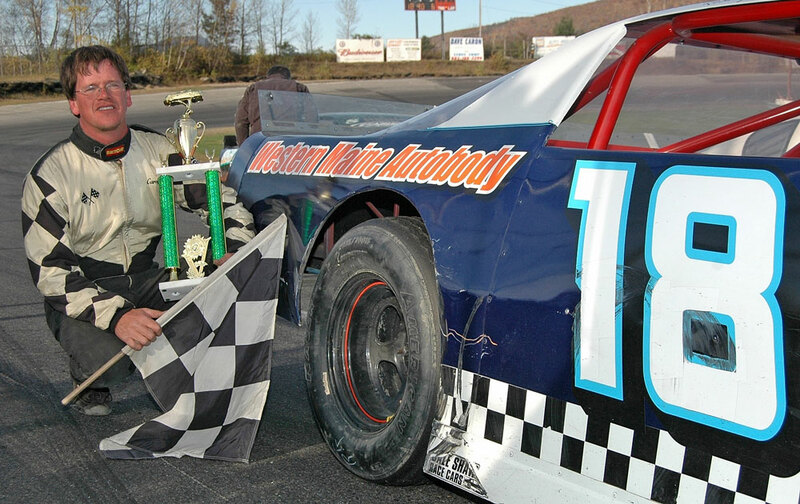 Naples ME (10/18/09 Championships aren�t easy to come by in sports, and auto racing is no exception. To win the deciding race to claim a championship is the dream of many a racer. 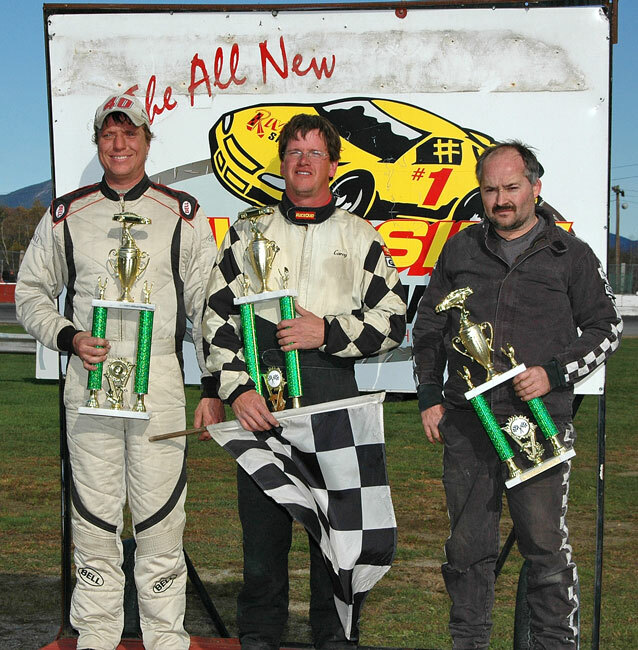 Carey Martin lived out that dream Saturday when he won the Pro All Stars Series (PASS) Sportsman finale at Groveton New Hampshire�s Riverside Speedway. 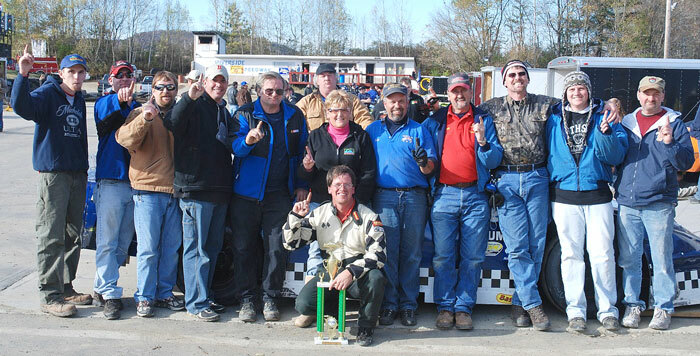 Martin claimed the feature over his nearest championship rival Mike Landry, securing the 2009 PASS Sportsman title by a two point margin. Clyde Hennessey finish third, Lyman McKeage fourth and Grant Arthur came home fifth. After the qualifying heats were completed the two were deadlocked in the standings, with Dan McKeage just two points behind. Clyde Hennessey captured heat one to sit on the pole, with heat two winner McKeage to his outside. Hennessey took the lead from the first green but Martin quickly moved up to second with Landry right on his bumper in third. The pair chased Hennessey until lap twenty nine when Martin took command. Dan McKeage was charging, up to second from fourth ahead of Hennessey and Landry, Arthur and Lyman McKeage. 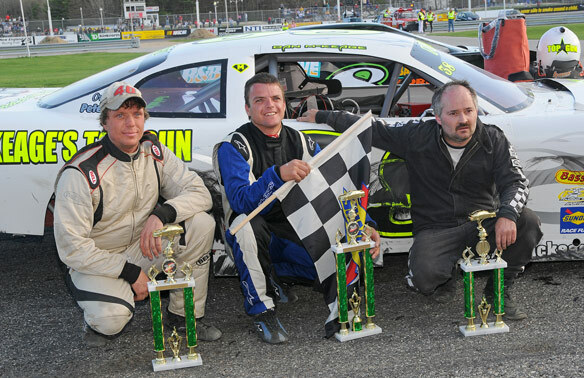 When the crossed flags were displayed it was Martin, Dan McKeage, Landry up to third and Hennessey fourth. 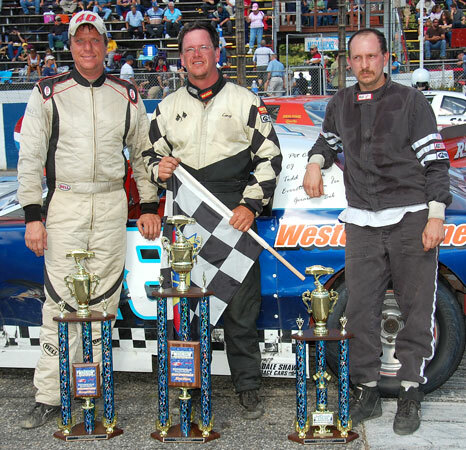 The front three were evenly matched ran nose to tail for thirty laps until Dan McKeages� challenge for a second PASS Sportsman title went up in smoke with driveline problems. McKeage was done for the day at lap 59. The final caution set up a sixteen lap showdown between the top two title contenders, with Martin on the inside and Landry outside. Martin got the jump on Landry at the green and try as he might, Landry could not find his way past the veteran Sportsman racer. 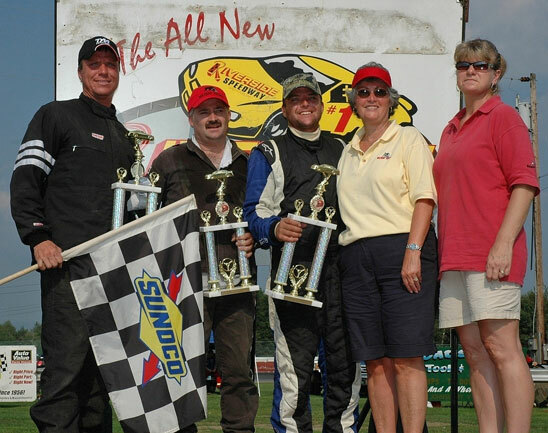 Landry ran Martin clean, putting on a great battle for the win but Martin wasn�t to be denied, taking the victory and the title of 2009 PASS Sportsman Championship in the process. It was Martins� third win of 2009 and firth top five in seven starts. Just three cautions slowed the seventy five lap feature event. Seven cars completed all the laps; heat race wins went to Hennessey and Dan McKeage. 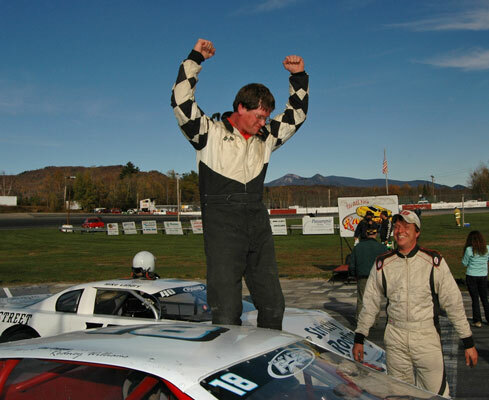 Carey Martin and his fellow PASS competitors will gather November 7th at Verillo�s Convention Center in Westbrook Maine for the 2009 Pro All Stars Series Banquet of Champions. 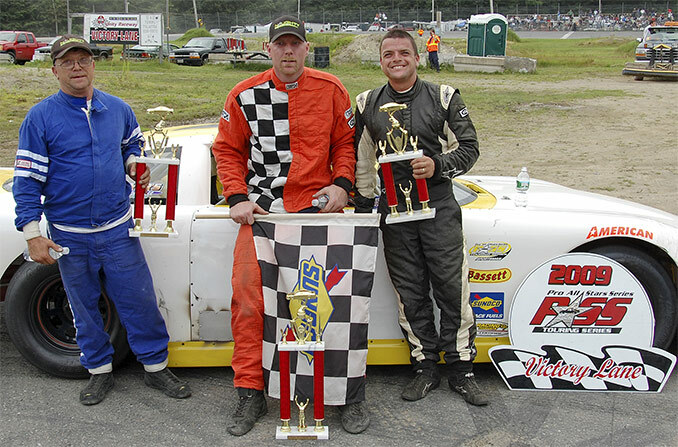 PASS Sportsman: Mike Landry, 2nd; Winner Carey Martin; and Donny Morse, 3rd. 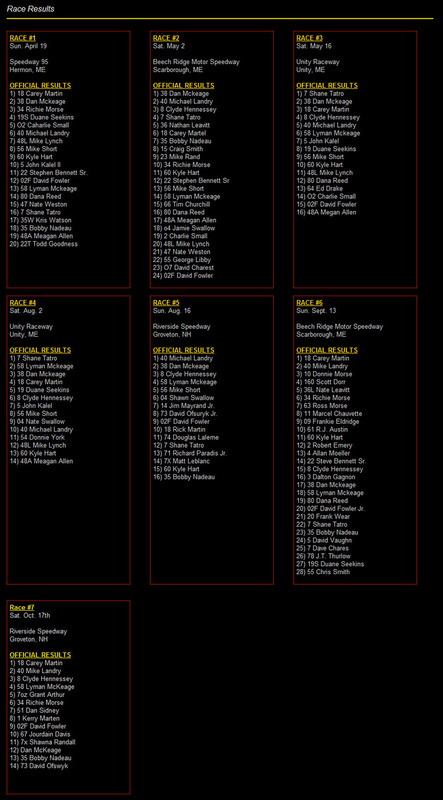 18) 8 Clyde Hennessey Windham ME 19) 3 Dalton Gagnon Lyman ME 20) 38 Dan Mckeage Gorham ME 21) 58 Lyman Mckeage Gorham ME 22) 80 Dana Reed Shapleigh ME 23) 02F David Fowler Jr.
Sportsman Top 3: Lyman McKeage, 2nd; Winner Shane Tatro; & Dan McKeage, 3rd. In other scheduling news, The PASS Sportsman series will wrap up their 2009 campaign and crown the 2009 PASS Sportsman Champion at Groveton New Hampshire�s Riverside Speedway on Saturday October 17th. 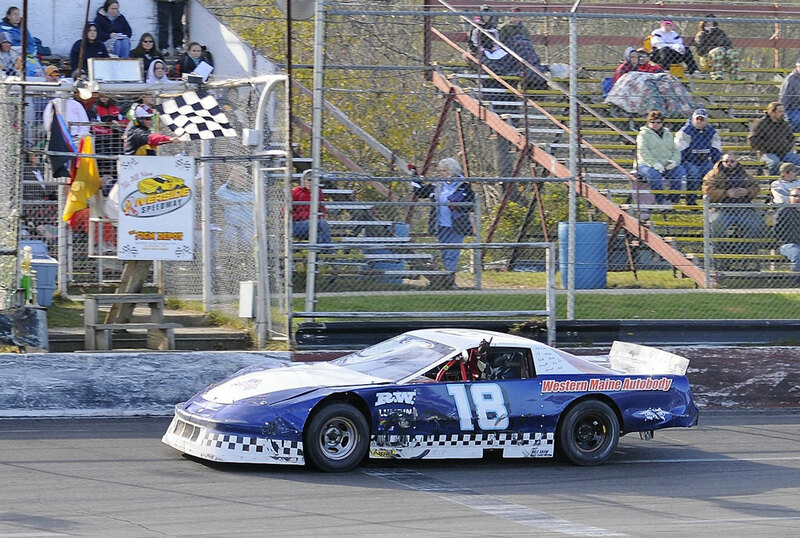 The addition of the Riverside Sportsman race completes the 2009 points schedules for all five PASS racing divisions and six racing series.